Today’s stage write up will be short. It was pretty simple, the breakaway went out from 3km into the stage. They got out to over 12 minutes (because the peloton let them). Orica GreenWedge did turns on the front to represent the Maillot Jaune. Then they all chased down the breakaway group. The breakaway group was led by Thomas de Gendt who pulled more than his fair share at the front with the others doing much sucking of wheel. But he was not to last. The big respect goes to Alexey Lutsenko (20 years old from Astana) and Kevin Reza (Europcar showboating again with two riders in the break – they must be desperate to secure that sponsor) who were the two riders from the breakaway that tried to make the break stick. Lutsenko held on until the final 4km and rode hard to try and keep the lead till the very end. The banana peels came out again on this stage with lots of spills and one big nasty one after the 3km to go line which took down a big GC support rider from Garmin-Sharp – Christian VdVdVdVandeVelde (I might have mis-spelt VDV’s name). He is touch and go whether he will be able to ride Stage 6 having dislodged the screw that holds down the plate that holds together his collarbone. If he continues tomorrow he will definitely earn a place in the chase for the Grey Jersey. So it came down to the sprint trains and it really boiled down to a two team race. 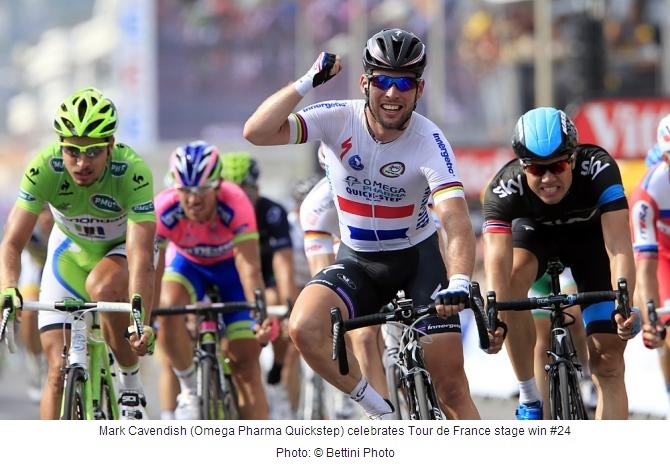 The Manx Missile (Mark Cavendish) – with Omega Pharma-QuickStep and the Gorilla (Andre Greipel) – with Lotto-Bellisol. The Tourminator’s (Peter Sagan) Cannondale team were still fuming from the ASO / UCI elimination of Ted King and were not in the contest in the end leaving the Robot Assasin to figure it out himself. Harsh call for a guy who busted it out on the TTT stage the day before to come up only 7 seconds short of the cut-off elimination time. Is it just me or does Sylvain Chavanel just look angry at this year’s race? Chava is hammering on all cylinders, and it could have something to do with Specialized giving him a new bike painted in Camaro red. The Manx Missile was launched and the result was never in question. Cav opened his stage win account in Marseille. The green jersey competition is wide open, bring it on. The GC boys all kept their noses clean in what I would say was a relatively boring stage. And Gerro remains in Yellow. 1. Ted King – For being eliminated from the Tour by only seven seconds with much injury and riding a road bike in a TT ride because he was so banged up to be able to tuck – Respect! Though this will the last time he ranks. I think I will add him as an asterisk down the bottom. 2. Geraint Thomas – Busted hip, he can’t even get out of the saddle to accelerate. Riding on – bad a$$. 4. Alexey Lutsenko – 20 years old and riding with cement in his veins. Hasn’t crashed but stuck it to the peloton to the very end. Respect! I knocked out intervals last night on the turbo, and got angry on the pedals lifting up to quite a pace – over 32km/hr for just under an hour. That is five stages down with 18 to go. Might have to knock out a couple of big proper outside rides on the weekend for some real riding. The insomnia is killing me, but I must remember Rule #5 – HTFU. I must remember to do a non-cycling post soon too.